Highly regarded, best-selling author Robert Christopherson has partnered with renowned geographer and educator Stephen Cunha and longtime media author Charlie Thomsen to establish Geosystems Core, a brief, modular, highly visual and flexible textbook and springboard into physical geography. This approach allows instructors to teach concepts in their preferred order, empowering them to bring in their own case studies and applications to further illustrate the core concepts. Instructors can also easily augment and extend the 1st Edition of the print book by leveraging the rich library of media and customizable assessment resources in MasteringGeography. This title is also available with Mastering™ Geography--an online homework, tutorial, and assessment program designed to work with this text to engage students and improve results. Interactive, self-paced tutorials provide individualized coaching to help students stay on track. With a wide range of activities available, students can actively learn, understand, and retain even the most difficult concepts. 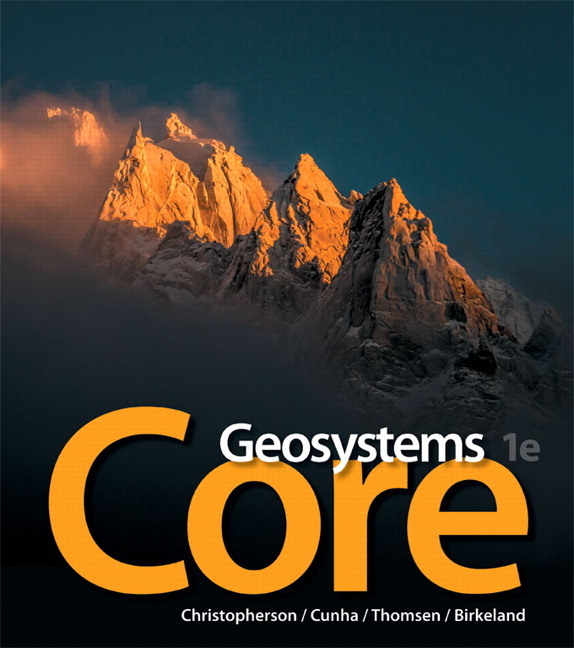 Geosystems Core, 1st Edition is also available via Pearson eText, a simple-to-use, mobile, personalized reading experience that lets instructors connect with and motivate students – right in their eTextbook. Learn more. Robert W. Christopherson attended California State University-Chico for his undergraduate work and received his Masters in Geography from Miami University-Oxford, Ohio. Geosystems evolved out of his teaching notes and was his graduate thesis: this is his life’s work. He founded the geography program of American River College faculty. His wife Bobbé is his principal photographer and has provided more than 300 exclusive photos for each of his books. Together they have completed nine polar expeditions (most recently in spring 2010). They attended the 2004 Arctic Climate Impact Symposium in Reykjavik, Iceland to acquire photo and video coverage and research. Robert is the recipient of numerous awards, including the 1998 and 2005 Text and Academic Authors Association Textbook Award for Geosystems and Elemental Geosystems, 4/e, respectively. He was selected by American River College students as "Teacher of the Year" and received the American River College Patrons Award. Robert received the 1999 Distinguished Teaching Achievement Award from the National Council for Geographic Education and the Outstanding Educator Award from the California Geographical Society in 1997. The Text and Academic Authors Association presented him with its Presidents' Award in 2005. Amongst many other things, Robert has been deeply involved in the development of Pearson’s Geoscience Animation Library, and he led the editorial board of Rand McNally’s Goode’s World Atlas 22e. Dr. Stephen Cunha is professor of geography at Humboldt State University. He received his BS, MA, and Phd from UC Berkeley. Dr Cunha is an active teacher, researcher, and mountain geographer. He has co-authored geography textbooks and the Atlas of California. Cunha was head of the California Geographic Alliance. He has international travel and experience in the Americas, Asia, and Africa, bringing a new international perspective and content to Geosystems Core. Cunha has numerous teaching and research awards and is active in various organizations like AAG. Charlie Thomsen is professor of geography at American River College, where he teaches physical geography, cultural geography, and GIS. Professor Thomsen received his BA from UC Chico and MA from UCAL. He is the author of Pearson’s Encounter Geosystems and Applied Physical Geography: Geosystems in the Laboratory, as well as many other assessment and media projects.